There are some UU blogs I always look at, and have for some time. There are usually the ones that scream, often the ones that complain—I won’t name names. It’s difficult to know the difference between those who merely love to complain, and those who are speaking out about real issues. Maybe you know what I mean. We’ve all heard that “cranky” person in our congregations or our lives, the one who always has a criticism at the ready, is doubtful about the success of every venture, never wants to try anything new. The best version of this is what’s known as the prophetic voice. Remember those Old Testament prophets? Not very popular, those prophets. And modern-day prophets are rarely more popular. When you point out a problem in society, most people don’t want to hear it. But the thing is, they’re often right, aren’t they? I think of Amos, who isn’t popular at all for pointing out the hypocrisy of his people’s leaders. It’s no less of an issue today. How do we stand in witness against society’s ills without becoming that person who just complains all the time? Is there a middle ground? And more to the point, how do we even manage this inside our own faith? I hear a lot of complaints, and I don’t think they are all coming from a good place. Even when they are coming from a good place, I wonder what sort of action is likely to come from them. Complaining is one thing, making a difference is quite another. That’s my thoughts. Now I have to complain about something. 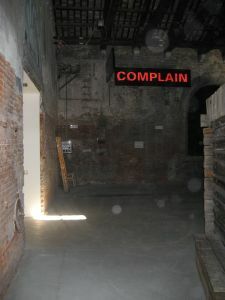 One of the issues with blogging in general is it is a medium of writing that is best suited for complaining. I read on Rachel Held Evan’s blog, “Opinion is the air that a blog breathes…” I try and remember that when I get discouraged that all my most controversial posts are also my most popular and it seems that no one reads my quieter more contemplative pieces… even though I often spend more time writing them. So true, Anna. Even in the infancy of this blog, that seems to be the case.